Making money mistakes; even big mistakes is not an anomaly. Although the theory that monetary recklessness is a predominant plague for the young and inexperienced is not far-reaching, it is being challenged by new data. The truth is, fiscal gaffes can happen to anyone at any age. Studies show the biggest money mistakes we make; decade by decade may be more about financial illiteracy than the economic irresponsibility of youth. Fears of navigating the treacherous path of money management and investing that keep doors of opportunity shut during the most productive years (between 30 and 60) often result in non-existent or shipwrecked retirements. At some point, everyone will slip on the path to financial security by spending what they should save, prolonging rather than paying off student, vehicle, or home loans and choosing the hot television series over time spent improving financial education. As such, no matter which decade of life you are currently in, financial acuity has been shown to be one of the best ways to avoid making big money mistakes in any decade. For the Millennial generation, retirement feels like a lifetime away. While in fact it is; failure to develop smart money habits during this time can make a difference to how you actually experience each decade of your life leading up to it. The biggest downfall linked to finances and people in their twenties is impatience. This is the trigger that lays the foundation for serious financial blunders that are often difficult to reverse. Research indicate that low earnings and a common resistance to delay gratification often lead to rapid debt accumulation. Building a slow growing nest egg is not typically very unappealing to the “live now pay later” mindset. Many people in their early twenties weigh themselves down with credit card bills due to spending beyond means on items such as clothing, entertainment, eating out, travel and hefty monthly car payments. Create a budget based on current income stream. Develop the saving habit by incorporating a saving plan of even a nominal amount into your monthly budget. Maximize company benefits by enrolling in retirement saving plans early and increasing them incrementally. Avoid using credit cards except to build credit and spend only what you can afford to pay off at the end of each month. Make a plan to improve or gain greater financial literacy. 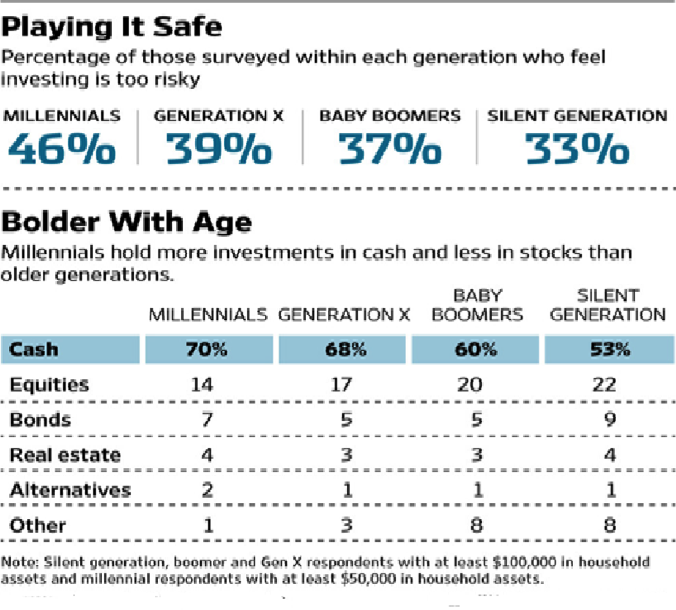 As indicated by the chart from BlackRock Global Investor Pulse; Millennials are more likely to play it safe when it comes to investing than other generations. This may be attributed to low financial literacy coupled with high levels of impatience and the fear of making mistakes. Unfortunately, it is a reluctance that can retard the early development of a healthy financial future. The push to get married and start a family later has created a commitment overload culture for some people in their thirties. Charlie Well from the Wall Street Journal explains that although people in this decade may be earning more than they did in their twenties, many people fail to make the appropriate financial adjustments to handle the increasing complexities of life such as marriage, starting a family or investing in a home for the first time. He also described “lifestyle creep” is another issue that happen to people in their thirties. According to Wells, people experiencing this phenomenon are those trying to maintain the same lifestyle of their parents at or around the time they left home. Unfortunately, they tend to overlook the fact that it may have taken years for their parents to achieve their current status. Lifestyle creep occurs when any increase in income translate into greater spending to keep up or maintain the lifestyle of friends or family. As a result, these lifestyle creepers naturally tend to curtail saving which means losing opportunities to compounded interest on saving. Other mistakes made during this decade typically involve major financial risks such as combining incomes with a spouse, investing in real more estate than you can reasonably afford and not purchasing life insurance. Since many of these decisions are made with lack of sufficient information, it is advisable to seek financial council before making major life impacting financial decisions. People in their forties are often immersed in a number of commitment issues. Helping a spouse get a new business off the ground, supporting the needs of growing children, assisting aging parents and home repairs are just some of the myriad commitments that people in their forties deal with. It is also at this time that concerns about the cost of college tuition, helping with wedding expenses and retirement savings or the lack of it begins to surface. Unfortunately, in our forties, 50% of our most productive years are already behind us. Without strong financial acumen or advise, it is easy to make big money mistakes in this stage of life. Often it comes from the financial demands from children and the needs of aging parents that are difficult to deny. 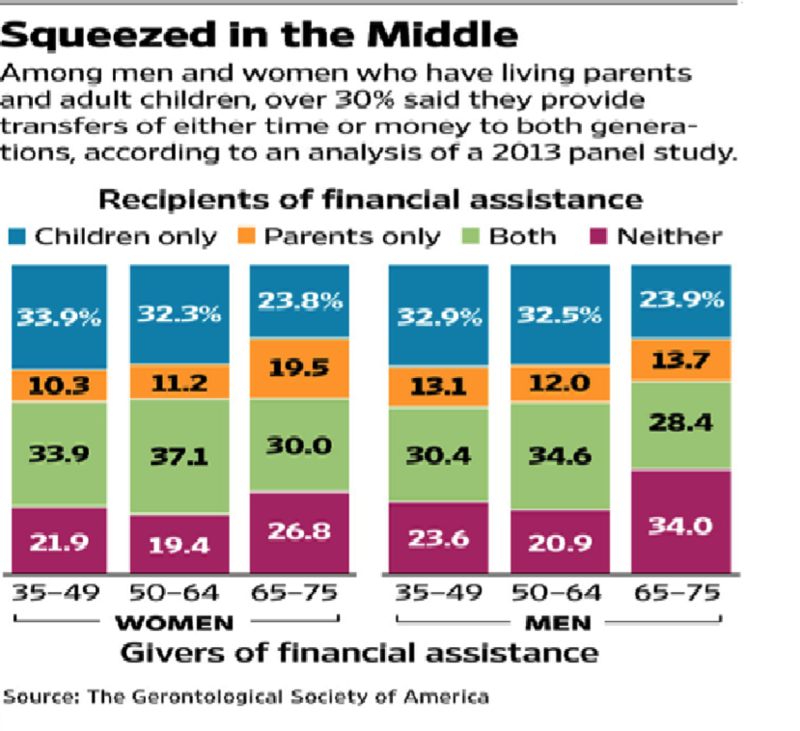 It’s no wonder the chart from gerontologist describes it as being squeezed in the middle. The biggest mistake people make during this decade is withdrawing money from savings or retirement accounts to meet the demands. Financial experts suggest exploring other ways to deal with the financial squeeze so that you can keep your retirement savings intact. Seeking out risky investments for higher returns. Not scaling back lifestyle expenditure to match changing family dynamics. Strong caveat for people in their fifties comes from Annamaria Lusardi, a professor at George Washington University School of Business who point out that while risky options like entrepreneurship may seem like a good way to ease the cash crunch, it is often a very dangerous approach. Lusardi, suggest taking a conservative approach to keeping your money working and growing for you in your fifties and beyond. This is a safer option than dumping savings in a fledgling business or overestimating the value of current skills and the market’s receptivity. The most common mistake people in their 60’s make is underestimation of savings versus lifespan. Advancements in technology, pharmaceuticals and healthier lifestyle choices that are helping people to live longer makes it difficult to accurately estimate how much we will actually need in retirement. In addition, sky rocking health care costs, home care needs and consistent escalation in cost of living expenses means people need to develop a feasible financial strategy that will sustain them for the long haul. The rush to withdraw social security benefits is another big mistake that many people in their sixties that are mostly unprepared for retirement make. But a recommendation from the Director of the Center for Retirement Research at Boston College Alicia Munnell to wait until age 72 instead of age 62 to cash in on these benefits may be worth heeding. Waiting can result in as much as 76% higher monthly benefits which Munnell says provides an important lever that translates into being a really big deal for those experiencing a cash crunch in retirement. Another major aging demographic issue for people in their sixties and beyond that is frequently overlooked is the potential of cognitive decline. Since this can impair decision making abilities, it has the potential to severely impact financial security as well. Financial experts suggest that people in their 60s and 70s should delegate important financial tasks to a trusted family member or financial adviser to minimize costly mistakes.